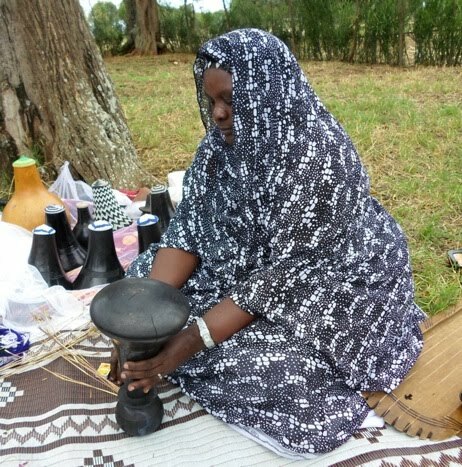 Ku-itira [usually written as "Kwitira"] refers to the processing, curing, sterilization and preservation of milk using fragrant smoke [incense] generated by burning special grasses or special wood. All things that have to do with processing milk fall under the name “ebisehi” in Rusongora. The practice of Kwitira is a central feature of maintaining ebisehi and of Songora culture in general, and is considered an essential part of the home life. The process of kwitira involves the use of special implements including a small hand-held and baked-clay furnace / censer [ekicunga] in which the sweet grasses are burned. Kuitira has the effect of flavouring and disinfecting the milk, and making it fragrant. Most of the work involved in Kwitira is done by women. Kuitura is always done indoors. However, in recent years demand for visual demonstrations of the art occasionally results in kuitira being done outside when audiences are too large to fit inside a house. When preparing Kuitira a woman or girl is supposed to sit on or besides the “rugyegye” platform where the milk pots are kept, they do the work humbly and while covering her head with eshuuka. The most important piece of furniture of architecture in a home is the Rugyegye. It is a raised platform with a level top surface about 15 inches above the floor, and it is the place where all the milk pots are kept. The lady of the house does most of her work while seated beside the Rugyegye. A traditional house without the Rugyegye is considered to be unfinished. The activities associated with the rugyegye are collectively known as “ebisehe”. The milk-pots to be treated with smoke are of several kinds: Kyanzi [pl. Byanzi - wooden conical container with a circular convex base on which it sits]; enkongoro [smaller-sized byanzi]; ebirere [gourds] and; ebisabo [very large gourds used for churning butter]. In order for Kwitira to be performed, the women must first go out and collect the stalks [esoso, obwitizo] of sweet grasses known as “mburara”. The esoso are dried over the course of several weeks in the rafters in the kitchen roof. The soot from the fire beneath also improves the condition of the esoso. When the esoso are sufficiently dry and aged, they are brought down and cleaned, and shone of any stray sheaths, and then bundles of this grass are stored away in the rafters of the house, so that a little bit of the esoso can be used from time to time to fumigate the pots. Fumigating the pots is done every day. During Kwitira, the esoso stalks are fed into the small hand-held censer [ekicunga] made of baked clay. Ekicunga is an enclosed spherical structure with two openings, in which the sweet-scented grass is burnt. The two openings on ekicunga are: the mouth on one side into which the burning sweet-grass is fed, and; the little chimney atop the furnace through which the smoke is forced into the milk-pot. A milk-pot [ekyanzi] is suspended over the kichunga, and brought up and down to cover the chimney atop the censer, as the woman blows air into the other opening - the mouth - of the censer to force smoke up into the milk-pot. When the sweet smoke has sufficiently circulated inside the pot and saturated it, the pot is then quickly covered with a woven seal in order to keep the smoke inside the milk-pot and prevent it from escaping. Before they can be treated with smoke, the milk-pots have to be washed. Around mid-day, women wash milk-pots using boiled “amaganga” [cow urine] and then rinsed [kujubunguza] with water and sand using a scrub made of natural fibre. The fibres used in scrubbing the milk-pots are special and are obtained from plants and grasses that include: entarame, omugyegye, orukoma, enyakati, enzitaimu, and akayebe. Unclean milk-pots spoil milk and so utmost effort must be made to maintain clean utensils. Milk spoils very easily and Basongora homesteads maintain special milk-houses which have to be kept in neat and hygienic condition at all times. The process of washing the milk-pots is called “kuchuragura.” If cow urine is unavailable for washing the women use boiled water mixed-in with a little bit of cow dung. After washing, they dry the pots by turning them upside down for several hours. At about 4:00pm, or in the early evening before the cows come home, women and girls get the “kicunga” [hand-held censer] and treat the milk-pots with the Kwitira fumigation process. The conical milk-pots known as Byanzi are made of wood [albisia coriaria] known in Rusongora [the languaga of Basongora] as “Musisa”. Although the heartwood of albisia trees is durable and is resistant to fungi, termites and dry-wood borers, the milk-pots are susceptible to cracking or spoiling milk if not cleaned properly. The Milk-gourds “bisaabo/birere” are also delicate and break easily. Besides washing milk pots and milk gourds, there is much besides that is done to maintain the health of milk and milk utensils. For instance, Basongora will say that “ekilerere cyagira omuze... ni kyiita amate” - which translates as “the milk-gourd has developed a bad habit... it is killing milk”. When a milk-gourd “develops a bad habit” its cured by “amanyeihamba” [literally “milk from the wilderness”] - which means a small amount of yogurt is dropped into the bad gourd to help its milk curing properties. After a few days the gourd is cleaned and reused, and it usually will store milk from then onwards without spoiling it. There is a special register in the language of the Basongora that attends to milk. Special words in Rusongora help to signify the importance of milk-related work, and the care that should be taken in performing the milk work. A lot of the vocabulary used in reference to milk conveys a sense that milk is to be handled with exceptional care. Basongora language relating to milk instilled in people a belief and reverence for milk. In Rusongora - the language of the Basongora - milk is referred to, and is treated as if it was a sacred living being. For example when drinking from a milk-pot its taboo to say the milk is “finished” - rather you must say that “amate nageihamu” [I have removed the milk]. To say that a milk-pot is full you say “ekyanzi kyihagire”, meaning [the milk-pot is satisfied]. Among the Basongora its considered bad luck to accidentally spill milk. The importance of milk is underscored by its use in ritual functions. If a boy wants to marry a girl, he can initiate the marriage negotiations between his parents and her family by deliberately spilling milk on her in public. Basongora praise beauty in anything by referring to it as being good or beautiful like milk. When drinking milk one must be sitting on a chair or on the ground. It is considered rude to drink milk while standing. Also while holding a kyanzi - the traditional milk-pot - one must place it bottom down in one’s palm, it doesn’t have a handle. Usually people unfamiliar with the social etiquette of Basongora will impulsively hold the kyanzi by its neck. Holding it by the neck is rude, and one who hold’s it in that fashion is said to be “strangling” the kyanzi. The kyanzi is always held with the right hand, when handing it to - or receiving it from - another person. The element is still viable. However, materials are far in the mountains, sometimes they have to travel long distances to get the materials, such as “obusoso” sweet grass. Other plant materials like “emirama”, “emigyeegye” are scarce and are mostly found in the national parks. Entry into these park areas is restricted. The milk-pots and milk-gourds are in homes, but because of the need to earn an income, most of the milk is taken to the market for sale. These days there is not enough milk in many Basongora homes to make the preservation and maintenance of traditional milk containers worth the effort of the women in the modern homestead. Many women are kept busy in pursuing income generating activities outside the home, and have no time to perform the elaborate traditional milk-related chores [ebisehe], such as collecting and sorting sweet grasses from the countryside. The traditional methods of handling milk now have competition: pasteurized milk is readily available in shops, and many homes have fridges, microwave ovens that can bee used to extend the life of milk. Many homes now have plastic or ceramic drinking cups and jugs, as well as drinking glasses, which all cost less and require less care than the traditional milk pots and gourds. Increasingly milk pots are used only as ornamental artefact in wealthy homes, or as devices for storing jewellery and other small household valuables - but their original purpose of use as drinking utensils is being lost. Modern educational programs don’t teach Kwitira or any other traditional skills, and yet keep children in school for long periods of time. The educational curriculum makes it hard for them to learn or participate in prolonged multi-stage processes that are involved in such as activities as Kwitira. Many children go to boarding school, and even when they are at home during holidays, very few have any exposure to Kwitira, or to any other traditional cultural skills. Perhaps the only way to teach young Basongora the arts of kwitira is to set up a special academy with the singular mission of promoting traditional skills. In recent years, there is a growing awareness that Kwitira is still a better method of treating milk than simply boiling it and drinking it. Milk that has undergone the process of Kwitira has a rich flavour and fragrance that makes it appealing to people. Occasionally at special events - especially at weddings or cultural exhibitions - Kwitira is now treated as a unique ceremony that is performed as a means of making the event more traditional and special. Milk that has undergone Kwitira is served to the guests of honour and to the bride and groom. Perhaps this new role of Kwitira as a “Milk Ceremony” will help to keep the tradition alive. Because of the unique and rare nature of the process of smoking milk [Kwitira], it has great potential to attract cultural tourists. The State of Uganda is a major producer and exporter of tea and coffee. Marketing agents and coffee restaurants have to continually develop new flavours in order to market their drinks. Kwitira is a viable method of flavouring drinks in which milk is a required component. Measures that should be implemented to promote Kwitira, include maintaining cultural palaces and cultural centres in Busongora - such as a proposed Royal Busongora Academy - where Kwitira can be performed for guests and taught to tourists and interested students, as a means of safeguarding and promoting the practice. Documenting the process of Kwitira in textbooks, and on a DVD and film documentary would also greatly help to preserve a record of the practice of Kwitira. Maintaining electronic recordings of Kwitira would enable the process of smoking milk to be aired on radio and television.